Project site of the first apartment which will have 130 units in Palungtar of Gorkha. Work on three other apartment projects have not yet started. KATHMANDU, Sept 6: At a time when Dhurmus Suntali Foundation has developed at least three integrated settlements in earthquake-hit districts and smoothly handed it over to needy people, the government’s plan of building apartments for landless families and quake-hit families living in extreme poverty is not taking off in the absence of a policy to identify beneficiaries. 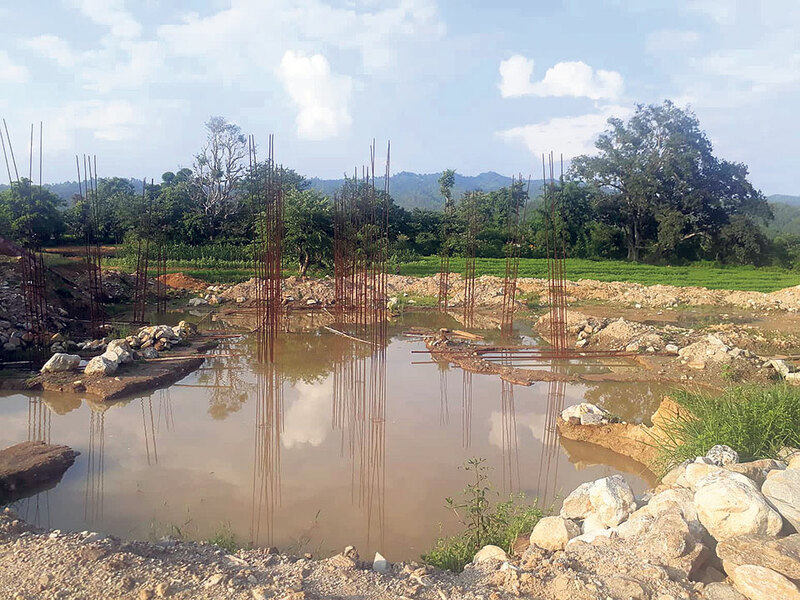 National Reconstruction Authority (NRA) started to build apartments for the needy households, who lost their homes in the 2015 earthquakes, in Palungtar of Gorkha in July last year. It had aimed to provide apartment to 130 households. But NRA has put the works on hold for the past six months without any clear reason. NRA asked the contractor of the Rs 155 million-worth project, Shyam Sundar Nirman Sewa Pvt Ltd, to put all works on holed in February. A month later, it asked the contractor to submit bills for completed works, according to a letter issued to the contractor by Central Level Project Implementation Unit -- a special unit for rebuilding public houses damaged by the earthquake -- via NRA. But the letter has not stated any specific reason. It only states that the program has been revised. Sources privy to the issue say that this kind of negligence in building homes for the needy people is guided by mala fide intention. But NRA officials denied such claims and added that dispute among the locals was the reason behind the delay. 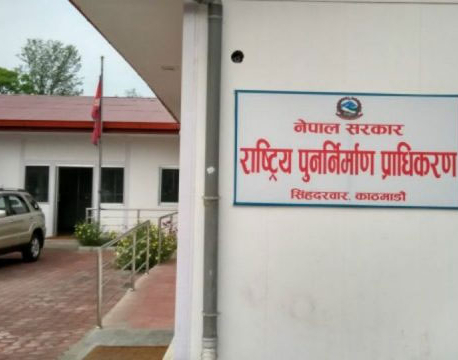 Deputy spokesperson of NRA, Manohar Ghimire, said that works on the project were put on hold due to dispute among locals regarding the selection of beneficiary households. However, Palungtar Municipality says there is no dispute as such regarding the project. Deepak Babu Kandel, mayor of the municipality, said that beneficiaries are eagerly waiting for NRA’s decision to resume the works. “I have been requesting NRA officials to resume works since February, but to no avail. This project is very important for targeted beneficiaries are not only poor but also landless,” added Kandel. NRA’s Ghimire told Republica that the NRA will initiate discussion on the matter very soon. He added that works will resume as soon as the policy to select beneficiaries is finalized. The Palungtar project is first of the planned four projects having a total budget of Rs 720 million. The construction deadline has been set at mid-January 2020. Remaining three projects worth Rs 180 million each are in Melamchi Municipality of Sindhupalchowk, Singati of Dolakha and Baireni of Dhading. The contractor -- Shyam Sundar Nirman Sewa Pvt Ltd -- has claimed payment of Rs 10 million for completed works of the Palungtar project. Bishnu Budhathoki of Shyam Sundar Nirman Sewa Pvt Ltd said that his firm stopped all works at the project site as asked by the NRA. “I don’t know when construction works will resume. NRA has not even paid me for the completed works,” he added.